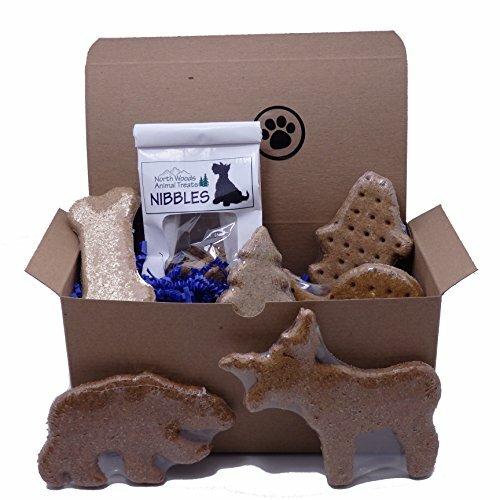 Thinking of getting your pet a dog subscription box? 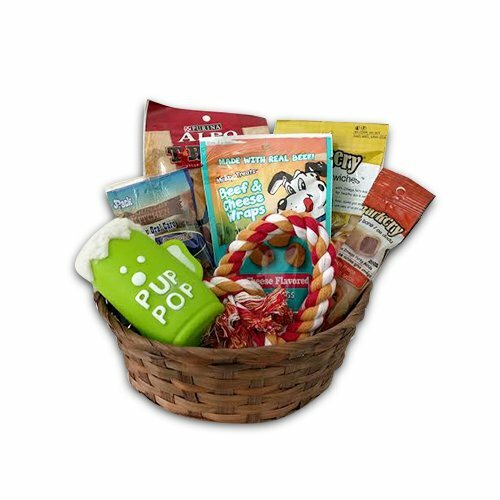 You can take your pick from a wide variety of subscription boxes filled with entertaining and innovative gifts for your dog. While some boxes come with predetermined goodies, you can also customize toys, treats, accessories, and other items that you think will suit your dog best. Gifting your pet a monthly dog subscription box is catching on with pet parents, and a growing number of pet companies are catering to this trend. Given how busy many pet parents are, it is far more convenient to order a subscription box and get high quality and useful stuff for your dog delivered straight to your home. It saves you time shopping for each item separately and perhaps more costly. 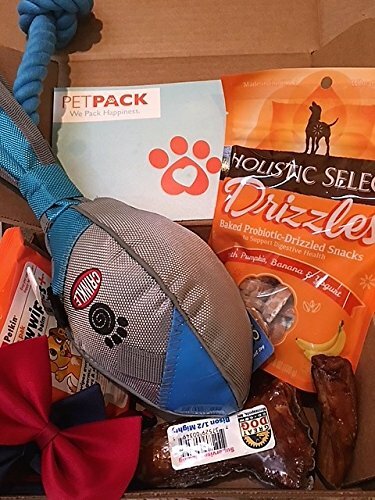 Along with toys and treats for dogs, the dog subscription boxes can contain dental hygiene products, grooming tools, training manuals, training equipment, leashes, collars, and even dog fashion accessories like bandanas, T-shirts, and raincoats. 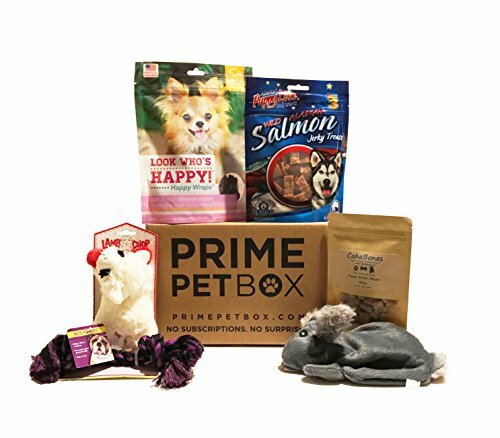 Depending on the company offering the dog subscription box, you can select a box filled with predetermined goodies or you can personalize the things you want for your dog. For instance, if you have allergy-prone dogs, you can ask for specifically non-allergenic food items that are safe for your pets. If you have concerns regarding the subscription prices, many companies offer monthly, bi-monthly, quarterly, and annual services. You can also pick a subscription box that fits your particular budget. Many pet parents have busy schedules and don’t have as much time as they would like to traipse online or offline pet stores, looking for something suitable for their dog. It is much more convenient to order a dog subscription box and get everything their dog needs in one go. Getting a dog subscription box is less expensive than buying all the included items separately, and you and your pet can have fun stuff to look forward to every month. It is not possible for you to know about each and every new dog-related item in the market, but with a dog subscription box, you can become aware of at least some of the good ones and have the opportunity to try these out. You can get useful products that you need for your dog’s hygiene, grooming, and training that you didn’t know were available. You can also ask for personalized products that are an exact fit for your dog’s requirements according to their age, breed, and health condition. A dog subscription box can be a great gift for your family or friends, if they happen to have dogs. Most pet parents will appreciate your thinking of their pets, and the pets will enjoy the items in the box. While we are talking about gifts, check out ‘Best Easter Gifts for Dogs‘. Selecting the right dog subscription box doesn’t have to be complicated. Make a note of the things your dog likes and might need, and compare these with the items that are on offer with a dog subscription box. Choose a dog subscription box that matches your pet’s requirements, or check if you can customize the box accordingly. There is no point in getting products that your dog doesn’t enjoy and can’t use. If your pet is prone to allergies, you need to make sure that there are no items in the dog subscription box that could trigger a reaction. You can also get a dog subscription box that specifically caters to allergic dogs and includes only non-allergenic products. Is your dog the rough and tumble type that likes to chew up everything in sight and wreck every toy they encounter? Then you might want to look for a dog subscription box that offers sturdier and tougher items that will withstand repeated mauling and last your pet a long time. You can also check out ‘The 10 Best Dog Bones for Power Chewers‘ here on ScoutKnows. Decide if you want to buy a one-time gift box, or would like to subscribe to receive a box every month. The subscription plans generally are for a month, three months, six months, or 12 months, and many companies offer free shipping. Some companies donate a portion of their subscription fees to alleviate the plight of homeless animals. By subscribing to their services, you can get good stuff for your pet, while, at the same time, helping other dogs in need. 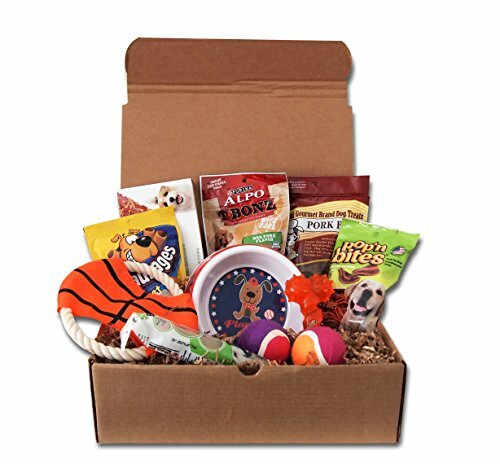 Dog subscription boxes are designed or can be customized in a range of innovative concepts and popular themes. While these designs are more geared to attract and amuse pet parents, your dog is likely to enjoy the included products. Some commonly included products are dog toys, dog treats, dog grooming products, and dog training products. Dog toys can include balls, frisbees, rings, chew ropes, dumbbells, rubber animals, squeaky toys, soft toys, and dog puzzles. Dog treats can include bones, jerky meat, biscuits, and kibble. Dog grooming products can include combs, brushes, toothbrushes, nail clippers, hair clippers, hair sprays, soaps, shampoos, toothpaste, and creams. Dog training products can include collars, leashes, training manuals and books, and training videos. 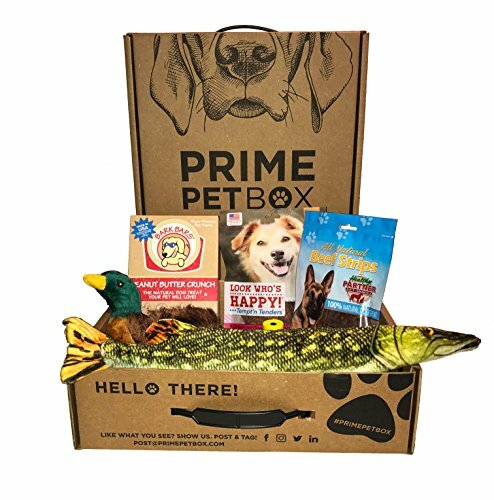 The company’s pet experts select the toys, treats, accessories, and other products contained in the subscription box, and each month’s selection is geared towards different themes. To sign up, create your pet’s profile account on the company’s website, and choose your subscription plan. You can pay for a one-time gift box or select a monthly or annual plan. The pricing is between $24.99 and $29.99. The company donates a percentage of your purchase to help homeless animals. You can gain reward points for recommending the subscription service to other people, signing up for membership yourself and filling in your pet’s details, and for taking surveys. If you get enough points, you can win additional dog products or a free gift box. 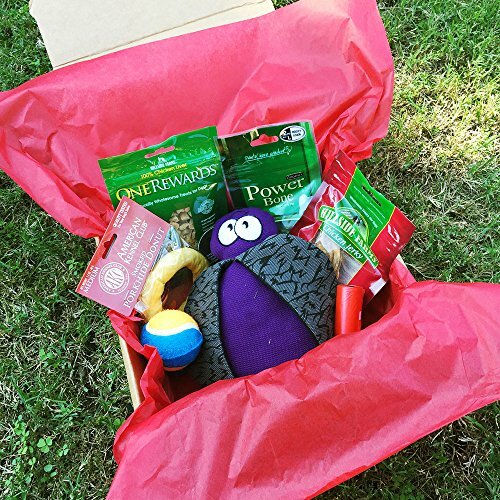 The subscription box includes dog toys, treats, and chews that are designed around a selected monthly theme, and you can get an extra toy with the goodies if you join the toy club for $9. You can subscribe for a month, three months, six months, or 12 months, and pay a subscription fee of $21 to $29. There is no extra shipping fee. Does your pet need new grooming items? Give this subscription service a try. You can sign up to receive either a mini box or a standard box, and select a monthly, quarterly, or annual subscription plans. Price range is up to $49.99. The monthly subscription box will contain different types of grooming products from reputable pet brands, and the basic lineup includes clippers, combs, brushes, shampoos, colognes, bandannas, and other items. You can get the box shipped for free in the USA, but will have to pay a fee for international orders. Looking for a gift for your puppy? 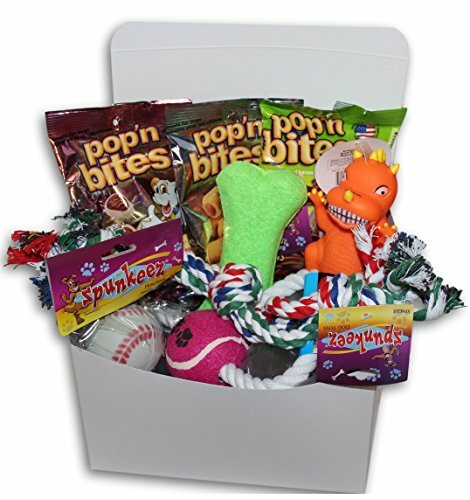 Here is a subscription box designed for puppies and young dogs, with teething toys and chews, treats, training tools, and grooming accessories. Pet parents can create a puppy profile and customize the subscription box according to their puppy’s growing requirements. You can choose a subscription plan for a month, three months, six months, and 12 months, with pricing between $29 and $39. You can either get a single gift box or pay a subscription fee between $26 and $29 for a month, three months, six months, or 12 months. If you provide information about your dog and your dog’s preferences, you can get a customized goodies box. You can select a combined toy and treat box, or boxes containing only toys or only treats. You can even select the type of treats you want. The company donates some proceeds from your subscription fee to animal charities, and you don’t have to pay for the shipping. Select the Popular Pooch option for a monthly subscription fee of $27.95, and get a range of toys, treats, and accessories. You can also customize items according to your dog’s needs. The subscription plans are for a month, three months, six months, and 12 months, and you can get discounts for the longer ones. Most of the items included are manufactured in the USA. You can provide information about your dog and receive dog toys, treats, chews, and accessories that are appropriate for your pet. For a subscription fee between $26 and $30, you can select a subscription plan of a month, three months, and 12 months. The company donates a portion of the subscription fee to animal charities. You don’t have to pay extra for the shipping. 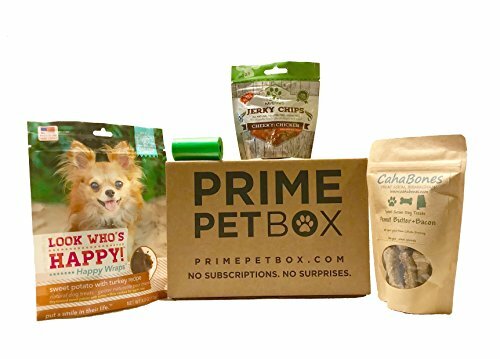 Dog subscription boxes are a great way of trying out new toys, treats, training materials, grooming equipment, accessories, and other items that can be both fun and useful for your pet. Some companies design exclusive products for their subscription boxes, and you can only get these products by signing up for their service. The items that you can buy elsewhere may be more expensive if you buy them individually than when you purchase them together in a subscription box. Both you and your dog can look forward to sampling new surprises every month, and you can be content that a portion of your subscription fee is going towards brightening the lives of rescue animals.